The switch to All-IP is currently taking place worldwide, and British Telecom wants to retire ISDN by 2025. Harrow Mencap, a UK charity organization, aiming to build a comprehensive communication system with affordability, flexibility, and mobility to serve more people and their families, has this urgent need to transfer from ISDN to All-IP. Started in 1946, Harrow Mencap is a registered independent UK charity (Charity No. 295263) that helps and inspires people with learning disabilities, autism and their families. They work with over 500 people each year offering a lifetime of personalized care and support from childhood through to older age. Their vision is “to change attitudes abilities so that people with a learning disability, physical disability or other disadvantage are seen as equal citizens with equal rights in Harrow and beyond”. With its deep social impact, Harrow Mencap has extended a second site to serve more people in different places. They used Avaya legacy system before with a number of ISDN2 lines, which cost quite a lot every month. Despite the high operational cost, the system had reached its end of life. To seamlessly connect with the second site and slash communication costs, they would like to rebuild a new modern, high-value, and low-cost telephony system on both sites. Taking all their needs into consideration, One Care iT Limited, a specialist cost-effective Managed Service Provider (MSP), has listed three different VoIP solutions with different PBX brands on the market to Harrow Mencap. 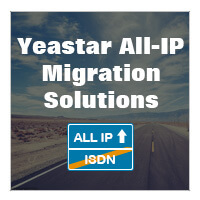 Yeastar attracted their eyes with “All Features in Box” solution – non modular pricing. Yeastar provided a lot more features than the minimum list required by Harrow Mencap. The ability to have long line extensions to their second site was also an advantage without purchasing a second PBX. After evaluating carefully, Harrow Mencap and One Care iT Limited have reached a consensus to deploy one Yeastar S100 VoIP PBX as their core telephony system, collaborating with 50 Vtech VSP726, 1 Vtech VSC754 and 5 Yealink SIP-W56P IP phones. With All-IP devices, Harrow Mencap were aslo looking for a communication partner who would aid and setup VoIP broadband lines and provide SIP trunks. X2Communications, a Yeastar authorized distributor in UK, was the perfect fit. With the help of Yeastar UK-based partners-One Care iT Limited and X2Communications, the installation and deployment of the whole new All-IP solution were rapid and seamless. Harrow Mencap has had the Yeastar VoIP system installed for about 6 months now. They are really happy with the outcomes that the call quality is extremely good compared to the old system and their phone bills have dramatically reduced. Linkus Mobile Client, a mobile application integrating iOS and Android mobile phones with Yeastar S-Series VoIP PBX, is the exact mobile app Harrow Mencap required. Employees could be reached anywhere by simply called to their extension numbers – no calls will be missed again. Apart from that, rich robust telephony features of Yeastar S-Series PBX like call statistics, call recording, conferencing, etc., have made the communication easier. Implementing one Yeastar S100 VoIP PBX and sharing it on two sides, Harrow Mencap not only saves the cost for another PBX, but also enjoys a scalable growth of extensions when employee number grows. Yeastar S100 VoIP PBX for Harrow Mencap now has a base configuration of 100 users and 30 concurrent calls. With the development of Harrow Mencap, the system can scale up to 200 users and 60 concurrent calls with the flexible modular design. Harrow Mencap now enjoys all the benefits of a modern All-IP telephony system with excellent flexibility. Internal call costs between extensions of two sides has been reduced to zero because the internal calls are FREE. External call costs are also kept low as they have transferred to SIP trunks, the prices of which are much cheaper than ISDN rates.